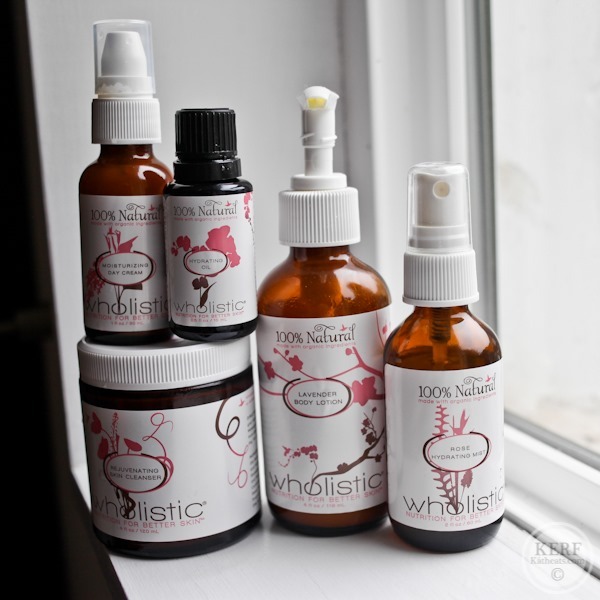 Today I bring you a post about a skincare line called Wholistic. Founder Elena is a Registered Consulting Pharmacist, Board Certified in Anti-Aging and Functional Medicine and the mother of 4 children. She created the brand with luxury and purity in mind. Elena sent me the above set to test out, and I’ve been using it for a month. I have found the line extremely refreshing! I often say that nutrition is not about what you don’t eat but what you do. Focus on filling up on superfoods and you won’t have room to miss the junk. 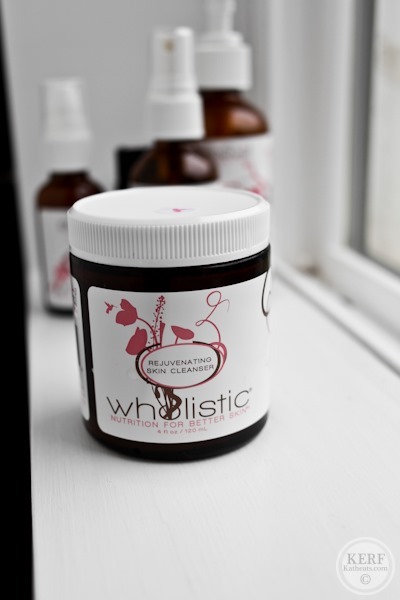 Wholistic skincare follows the same principle, and that’s what I like most about the product. While it is, of course free, of iffy beauty ingredients like parabens, synthetic fragrances, artificial colors and dyes and chemical stabilizers, what makes this line special is the ingredient lists are packed with natural components known to provide “nutrition for better skin.” While you can certainly DIY simple green beauty products, Wholistic takes those simple bases and adds hand-picked essential oils and herbs with a purpose. 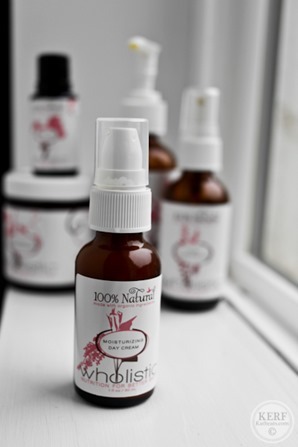 For example, the Rose Hydrating Mist has rose and lavender waters, witch hazel and herbal extracts of elder, malva and chamomile flowers. I think about how long it would take me to hunt down these herbs in the wild and mash them into a useable paste and appreciate these products a lot more. The Lavender Body Lotion is perhaps the most healing of all. As winter ended, my arms especially had some rough patches that are now gone. The lotion contains a blend of oils (jojoba, avocado, coconut, olive and calendula) but what I noticed most about the fragrance was the bees wax. There is a slightly sweet honey smell that I just loved. This lotion isn’t one to slather over your whole body (it is pricey) but rather I focused on the areas I needed it most. It leaves the body with a glisten that kept my skin moist. 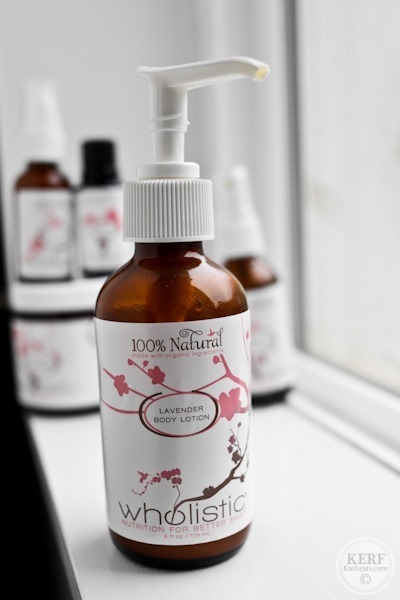 One word to describe the rose mist: refreshing! 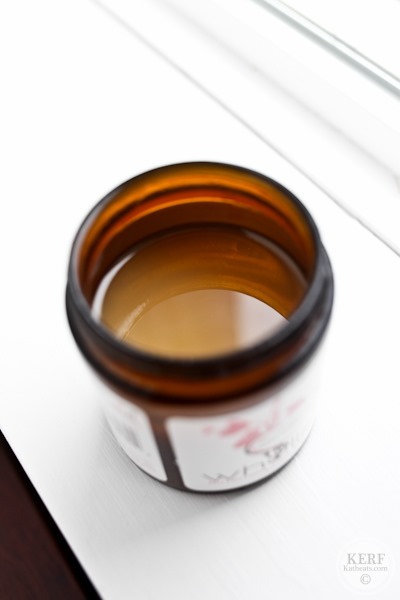 The Hydrating Oil I saved for times when I needed a little extra: after a hot bath or before bed. It soaked into my skin well and didn’t leave me (or my pillow) feeling too greasy. It’s scent is very mild too, so it was great for before bed. Finally, the Rejuvenating Skin Cleanser. It contains raw unfiltered honey, gooseberry and green tea. I like that the directions say to actually leave on skin for a bit to allow ingredients to soak in. This cleanser isn’t just about removing dirt from the day but it serves to balance skin as well. If I have one bone to pick with the line, it’s that I found the cleanser hard to use in the shower in its current container. Balancing the cap in my hand while removing the product with my fingers all while trying not to let the shower stream near was a bit of a juggling act. I liked the feel of the product on my skin though. It barely tingles! Another thing I often say about eating real food is that when you do so, you’re eating foods in the proportions nature intended nutrients to be absorbed. Wholistic writes: “All of our ingredients are blended perfectly so that each arrangement is in harmony with nature.” I love that. The Wholistic line is quite expensive. I’d say it’s a good fit for someone who already uses a variety of high end beauty products and wants to proactively purify and nourish her skin in a natural way. Because of the small amounts used, these products will definitely last a while. 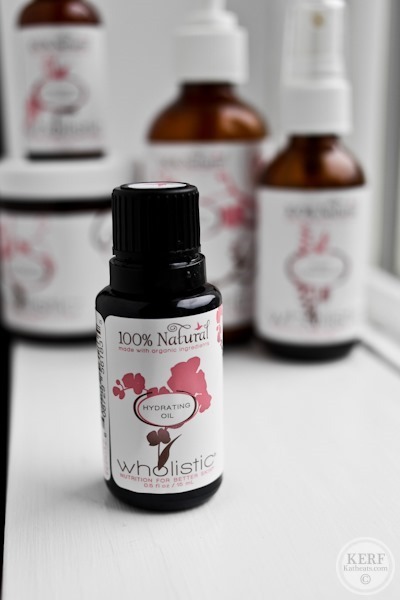 You can buy Wholistic products at the online store here and even receive 15% off with this code: ffam15. I have pretty good skin in general, so I can’t say it went from drab to fab, but I loved the way these products felt on my skin. Here’s an opportunity to win an Anti-Aging Starter Kit, which includes the Rejuvenating Skin Cleanser, Moisturizing Day Cream and Rose Hydrating Mist! 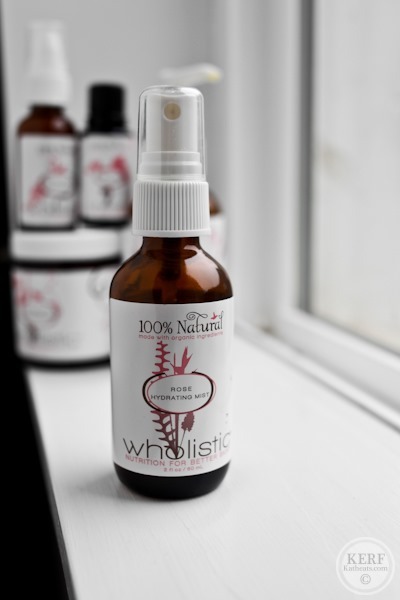 This post is sponsored by Wholistic. I received the above products gratis and was compensated for my time putting together the post. Their stuff looks great. I really think it’d be worth investing in some good skincare products. I absolutely loathe makeup so I need a way to make my skin pretty without it. Thanks for the review! These look (and sound) fantastic. I love beauty products that are completely natural–if we don’t eat chemicals, why should we put them on our skin? 🙂 Thanks for the review and giveaway! This line sound wonderful. 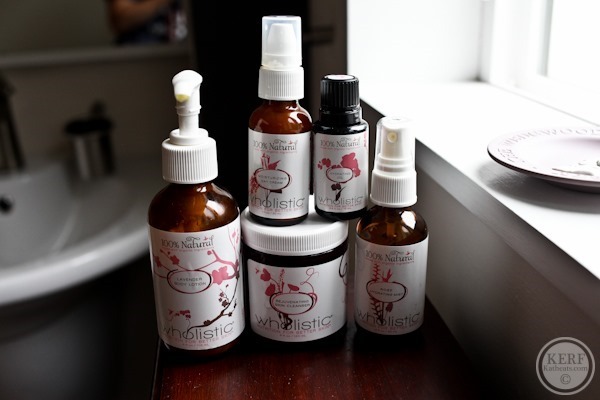 I’m really into natural beauty products, especially when it comes to skincare. Their skincare line sounds really amazing. It sounds like the skin cleanser would give skin nourishment similar to the oil-cleansing method, but with less time. We have honey bees – so I love the use of honey in these. Thanks for the great giveaway! These look so pretty and I love natural skincare products! I’ve been looking to change up my routine, but these are definitely not it…. $95 for 1 ounce of the day cream. WHOA! I already use only natural beauty products on my skin, but I am looking for the perfect one, that would leave me completely satisfied! I would love to try this line! i know this is a post about skincare, but i really love what you said — nutrition is not about what you don’t eat, but what you do. 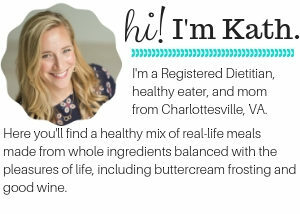 it makes me feel better about the 7 mini cupcakes, and more encouraged about eating better overall, instead of the little slip-ups. This looks great, Kath! Thanks for hosting! This stuff looks interesting! My nose has been sooo flaky that I am up for anything these days!! these are more than a little pricey! Look great but the prices are way out of my league. If you have only been using these products for the past month, what skincare products were you using prior? Do you use just the alba cleanser or any other products with it? Your skin (in person) is radiant! Cleanser and moisturizer… and thanks! Thanks! Is the moisturizer an alba spf? If you look at the ingredients list for Alba products, the ingredients are not all natural at all. In fact very misleading. They use fragrance and just that can mean up to 4000 toxic ingredients in one. Alcohol is another one. It is an extremely cheap preservative and dries out the skin. I usually tell people if they can’t pronounce the ingredients then don’t use the products. These products look great. I’d love to win the giveaway. I’m always looking for natural beauty products. I sure wish these were more affordable though! Sounds like a great line of products. I have never heard of this before but enjoyed reading about it. Your product reviews are so thoughtful, Kath! Thanks for being perfectly descriptive! This skincare line looks great, but it’s a little pricey for me. Thanks for the review + giveaway! Are you aware that out of your last 7 blog posts, 4 have been about “products”. 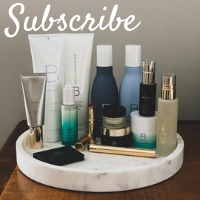 Look at your front page – there is an a (sponsored) wine recipe, a post about nature box, one for products you like and now 2 days of looking at a post for overpriced skincare! I love your blog and I’m sorry to complain but I thought maybe with life being busy you weren’t aware of how much of your content lately has become this type of post. This is a nice product , I use it and yes it is expensive but because you use so little and it works so well it ends up being quite cost efficient. I know I am going to keep using it and am very happy with what it does for me. Which product are you referring to? Do you use all of them, or just the cleanser? And great points in the article posting on filling up on whole foods rather than junk food. Junk food is so calorie dense, that a little bite will instantly shoot up your calorie count. These products look amazing! I’m constantly on the search for more healthy alternatives to the things I put on my skin. My poor skin has been through so much with all the makeups and products we use but this looks like such a great alternative for good skin, thanks for the post! Everything is perfect. I can’t wait to own even just one of this and be a part of my beauty arsenal.Honestly, I haven’t use any of these and I will be glad to try.